Gling rgyal or Langjia, an agricultural area, is where my family started the trip in the morning. 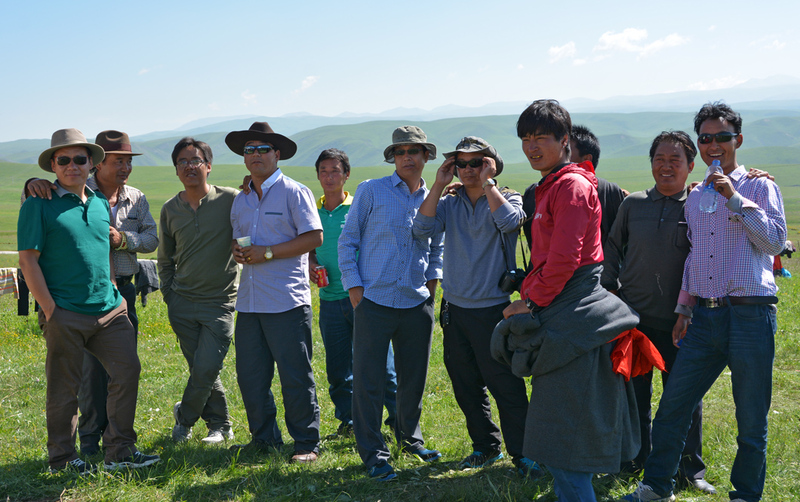 A day on the grassland with my paternal family—the biggest family reunion I’ve ever attended. 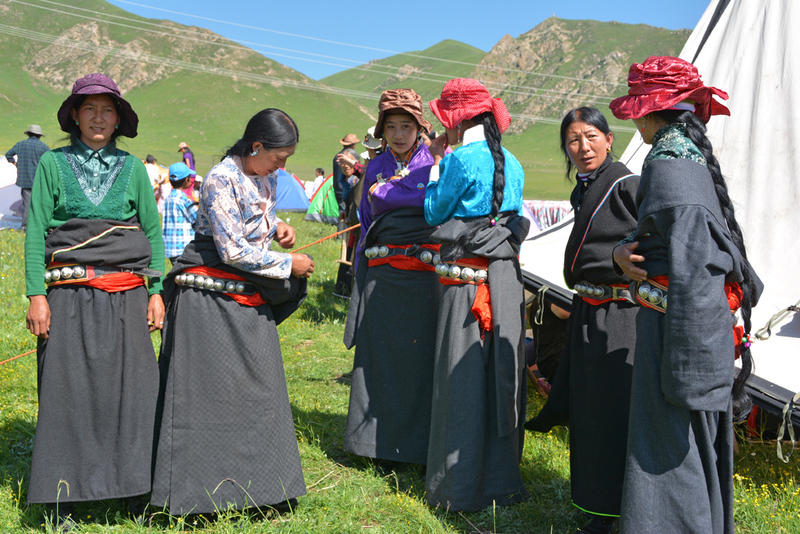 Fifty-six families, 180 people total, from two distinctive worlds (agricultural and nomadic), joined together on Mgar-tse’s grassland in Rebgong, Amdo region. They included farmers, animal herders, educators from elementary school to university, small business owners, doctors, students of all levels, and government officials. The majority of my family members come from an agricultural area, where we originated. 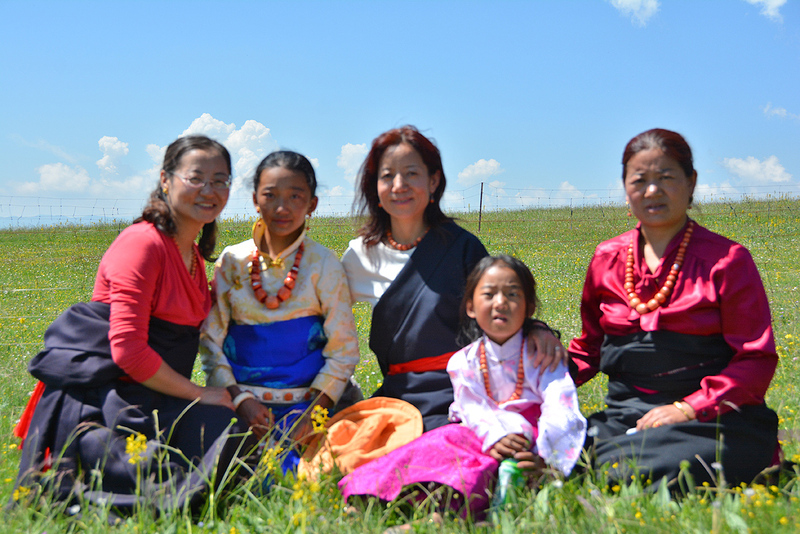 Most of us still grow crops such as wheat, barley, flaxseed, and rapeseed; whereas my aunt, Lhamo, and the families of her eight children, live on the grassland of Mgar-tses. 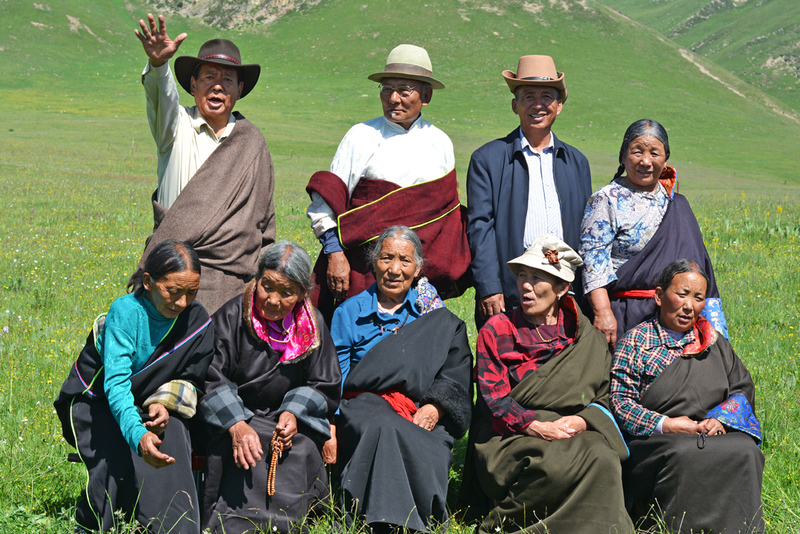 It’s 2700-meters above sea level, and they herd exotic yak and Tibetan long-legged sheep. Although these two areas are within a 45-minute drive, they offer two very different lifestyles. The seven siblings of my father have a few opportunities each year to meet during special occasions, including Losar (Tibetan New Year), Klu rol (Lerol) dance festival, weddings, donations honoring one’s life or religious ceremonies. However, they’ve long dreamed of an extended family reunion to introduce younger generations, meet newcomers and socialize at a greater level. And my second aunt’s passing a year earlier energized them to put into action a plan for a gathering this summer. I’m grateful my visit home occurred a few days before this amazing family rendezvous. Arrived the simply natural and beautiful grassland. 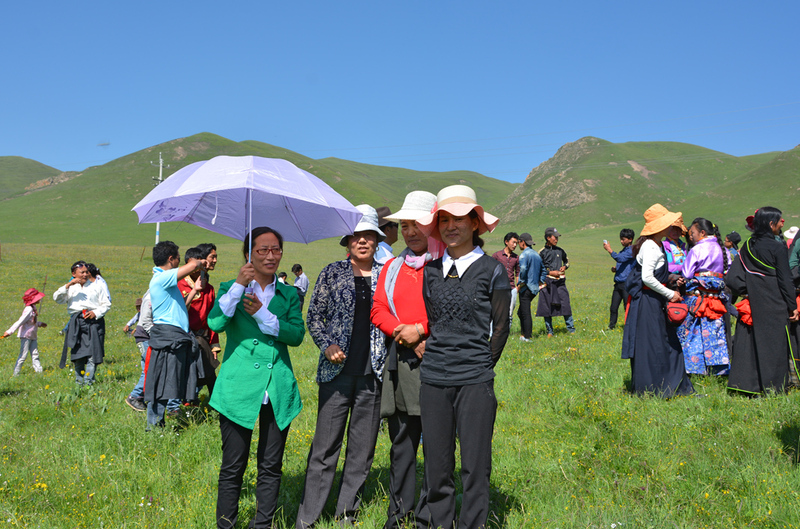 We chose to gather on the nomadic grassland because we wanted to pay respect to my aunt, Lhamo. She is the aunt that my great-grandfather, a firm Bon believer, gave up for adoption in mercy to an elderly, childless nomadic couple. 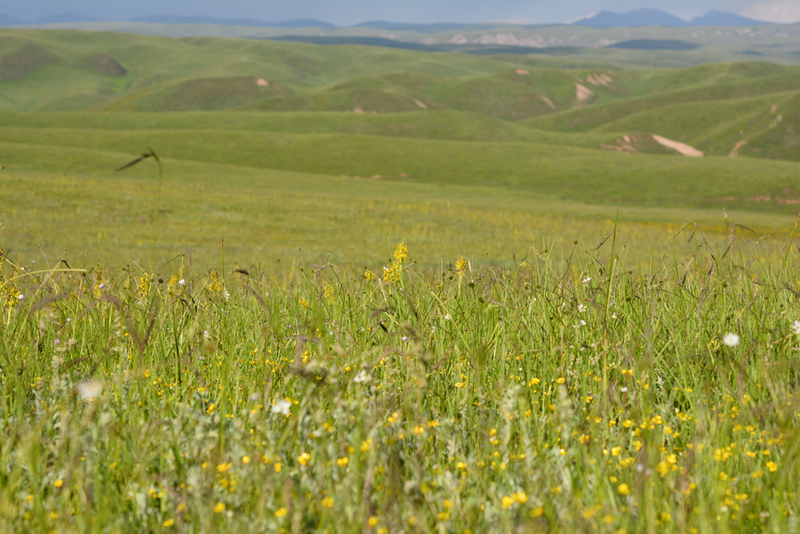 Also, there is no place in the summer more beautiful than the Tibetan grassland. It’s capped with wildflowers in yellow, white and blue that yak, sheep, and horses kiss and munch at their leisure. 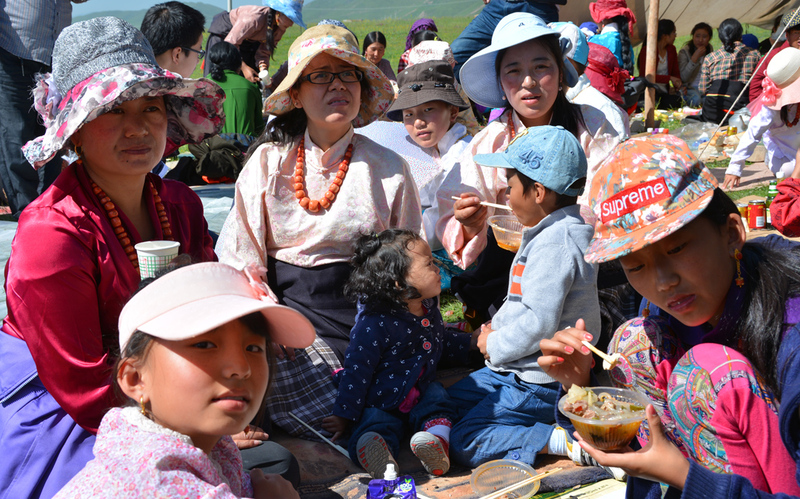 Almost everyone dressed in traditional Tibetan robes, which some youngsters shed as the day’s activities progressed. 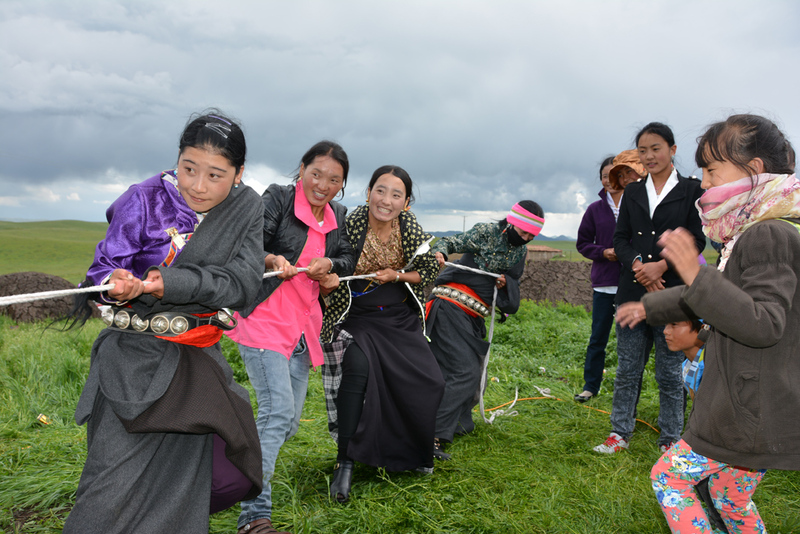 We sang songs, danced in Tibetan folk processions and played games, as well as shared old-time and sometimes tearful jokes. We greeted, chatted, photographed, and entertained one another all day long. 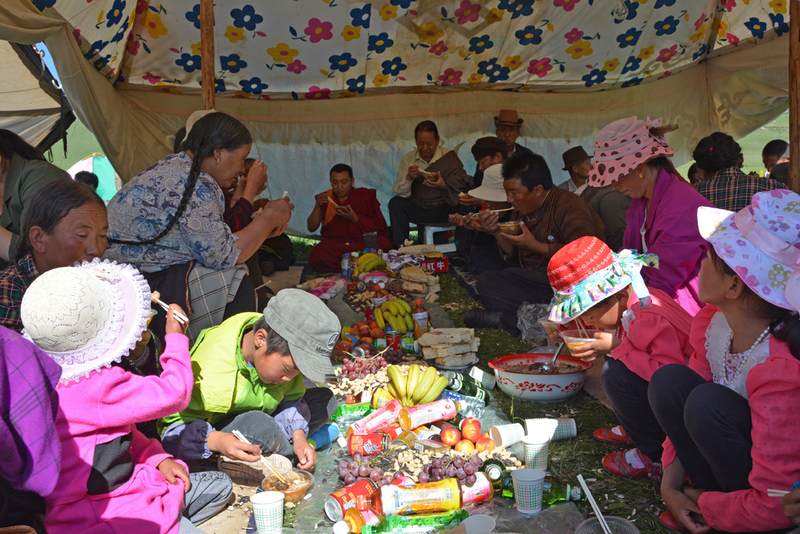 From an overloaded Tibetan-style tent, we started the day enjoying brunch: ping sha–a full-bodied brothy stew made of mutton, bean noodles, radishes and green vegetables, paired with famous Rebgong bread that my farmer cousins baked. We sipped milk tea and fruit juices, while admiring the natural beauty of this magical place. For lunch, we had herdsmen’s fresh mutton and sausages of all sorts: meat, bean flour and blood. Our grass-fed meat fairly oozed with wholesome and robust flavors. Some had fruits like grapes, nectarines, watermelon, and summer pears while others opted for dri (the female yak) yogurt to complete the meal. We enjoyed some more meat for supper as well as freshly made wheat noodles soup with leafy greens swimming in the savory mutton broth. Simple yet satisfying. Of course, there was more singing and dancing. Even my 80-year-old aunt, Shawo, sang a Tibetan folk song. As the sun ready to hide behind the mountain to the west, my father, uncle and other elderly men performed a goodbye in a circle—blending their voices in sync, hands in the air, feet crossed with another in dance forms, to say ‘so-long’ and close the day. My trip from the Western world to the East was beyond worth it, just for this one family day. A view of the highland. Another corner, enjoying Ko for brunch. The big guys of the day directing the photography. Each family posed for a pictures with them. My nomadic cousins whom I met for the first time. After the massive reunion photo shoot. My second cousin performing a modern Tibetan dance. My cousins pulling against the men and winning a game of ‘tug-of-war’. My darling sisters, sister-in-law, nephew and nieces enjoying the day. My second cousins from the farming area. Aged three and four, my adorable nieces also seemed to realize this differs from city life. Dressed for the day, in the middle of my lovely sister, sister-in-law, and two nieces is moi. Lovely. I hope you are having a wonderful trip. The pictures look beautiful. That was a joy to read and the pictures are beautiful. Thanks for sharing. Thank you, Robyn and Todd. I’m having so much fun. Thank you for sharing your life, family, and homeland with us, Jolma. What an amazing place and a fantastic day. Your blog is helping me keep everything in perspective – what could be better than sharing time and fantastic food with family. Thank you very much, Steve. Life is about experiencing and gaining perspective. Thank you for sharing your thoughts. Your photos and descriptions make me feel like I am there. Beautiful photo of you and your sister, sister-in-law & nieces too. Great photos, looks like a beautiful, fun day. I wish I could have been there, but the images make me feel like I was. Please tell everyone I say hello! This is a wonderful beginning to your project. The reunion was a very rich experience and aperfect lace to gather stories to share in your work. I especially appreciated the brief discusion of the locale. The pictures help but I want to see MORE of the wonderful landscape. Yes, stories around family, Patrick. And thank you for being a big supporter of my project. I have added landscape images and will share more pictures of the grassland in upcoming posts. Thanks for sharing! Wonderful photos. I love all the variety of hats. As a bread baker, I would love to learn about the Rebgong bread, possibly a recipe and photo? Thank you, Gail. I will feature a story on Rebgong bread, of course, with photos. Bread recipes will also follow and be shared with you. Absolutley beautiful photos! And I appreciate the stories behind the images. You help make the world a bit smaller–thanks for that. You made me very happy, Steve. Thank you. Jolma: An extremely well-written post. What a treat to read about such an important day in your Tibetan adventure and to view photos of your beautiful family and the amazing landscape. Thank you for sharing. Thank you very much, Eric. I surely enjoyed sharing. Beautiful Jolma. Thank you for sharing! Thanks for sharing your trip in photos. What a beautiful place! One day like this might be the highlight of my entire lifetime. How precious! Amazing you are connected to so many rural and nomadic people. Your life is a great bridge, Jolma-lak. I love the grassland photos! I hope you can make the trip sometime and experience the real Tibetan culture!